One of the strongest values of Jewish tradition is gratitude; expressing our thanks and awe to G-d for blessings large and small in our lives. Our very lives are a blessing, and as such, we have obligation to use our lives for good, for making the world better. Tonight the gorgeous baskets of trimmings donated by Temple members and arranged by our VTRS students honors that commitment. In making these basket, we share a special opportunity to express our thanks, to notice our own blessings, to decidedly act on our ability to move to world, to make a difference in someone’s life, to repair it. But did you know that engaging in the act of tzedakah like this can also be done in celebration of a birthday? It’s Rabbi Leah’s Birthday. Rabbi Leah is a present to us, to all of our families and friends at Vassar Temple, to her family and friends outside of the congregation too. She is a blessing to be grateful for. Rabbi Leah comes to us with her own unique gifts like the courage to relocate to a new place, to join and lead in a new spiritual home. She comes have been willing to meet a lot of new people, willing to talk with us, to inspire us, and to share her wisdom and knowledge. 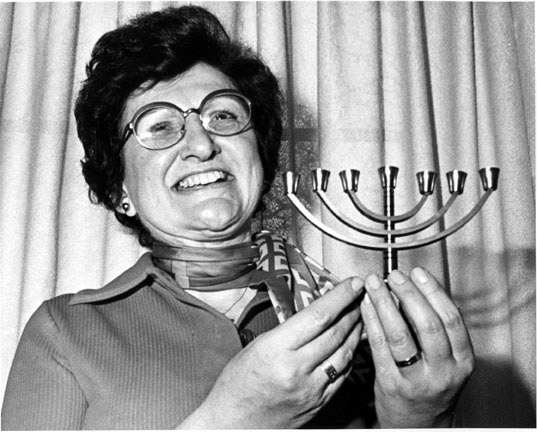 Her gifts too include her warmth, enthusiasm, her abiding passion for Judaism, her commitment to spiritual growth, faith and more. Tonight, we have a golden opportunity to recognize the blessing of having Rabbi Leah, and to celebrate her both by engaging the mitzvah of helping to feed others and by letting her know just how grateful we are to have her. It is said that a birthday is a “mini-Rosh Hashanah,” referring to the tradition that Rosh Hashanah is the birthday of the world. for giving us life, sustaining us, and enabling us to reach this occasion. And of course, a birthday is the best time to sing! 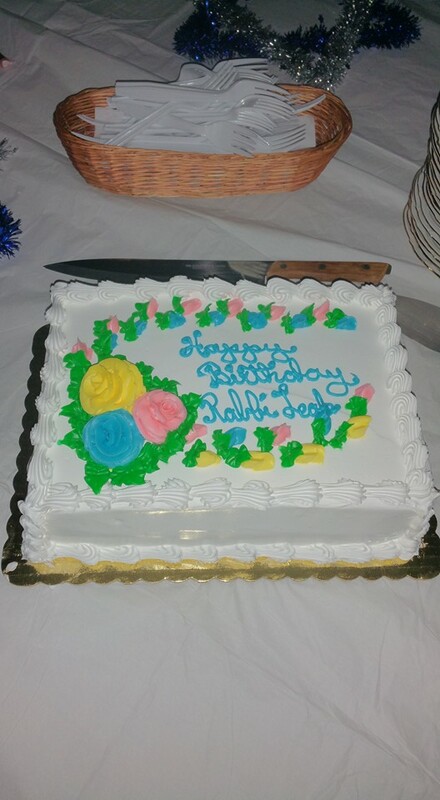 Happy Birthday Rabbi Leah! Cross-posted to This Is What a Rabbi Looks Like. 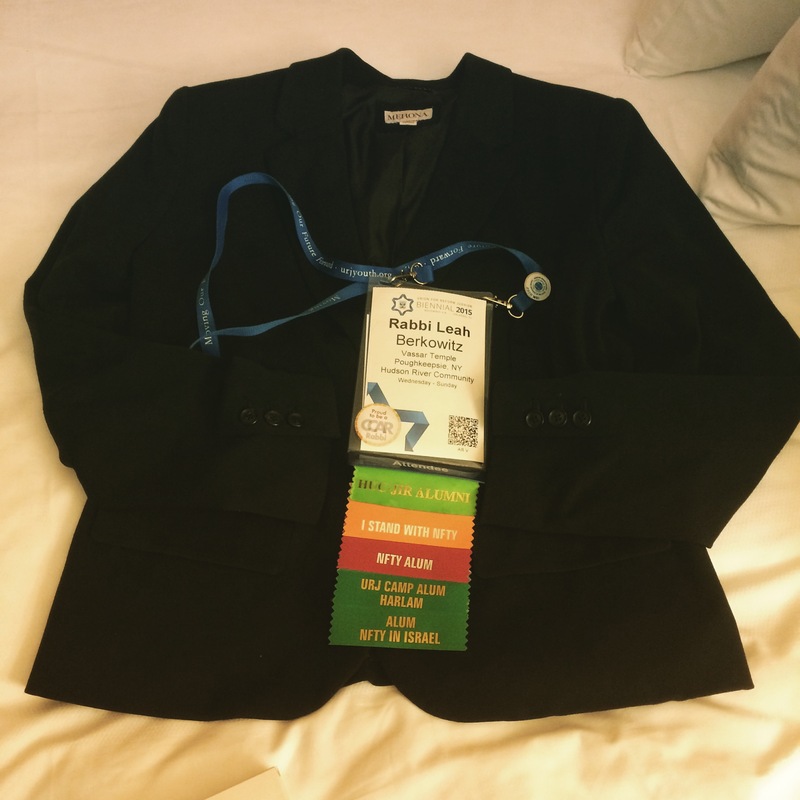 The Biennial Uniform: Black blazer, large nametag, and ribbons from every Jewish program I’ve ever been a part of. We at the Biennial weren’t immune to FOMO. At any given time, there were 20 different sessions to attend, on four specialized tracks: Audacious Hospitality, Strengthening Congregations, Engaging our Youth, and Repairing Our World. There were concerts, exhibits, shopping, and services, stretching from 7:15 a.m. to well after midnight. Often, I’d run into someone on my way to an event and end up reconnecting instead. Though I was excited to be in Orlando, I was lucky if I got outside for 15 minutes each day. I spent an hour in the pool total. I never made it to Disney. So I was glad when we arrived at Shabbat which, while not exactly restful, brought everyone together for a shared Shabbat worship experience. Biennial services are not to be missed: 5,000 Jews gather together, music is led by a choir, a band and the leaders of our movement, spontaneous horas break out so often that I’m not sure we can call them “spontaneous” anymore. It is the closest a Reform Jew will ever get to a tent revival. These massive tefillot don’t just create an inspiring prayer experience in the moment. They set the trends for the next two years: with new music, new uses of technology in prayer, and new challenges to address as a movement. The four tracks were integrated masterfully into the service: young people from NFTY and our college programs read Torah and spoke eloquently about issues such as gun violence prevention and the negative impacts of standardized testing on minorities. The most powerful moment came when Rabbi Rick Jacobs called upon various groups to recite the Torah blessings, gathered around Torah scrolls stationed throughout the ballroom. The first aliyah was for people like me: born and bred in the Reform movement and loved every minute of it (a lot of rabbis in this group). The second aliyah was for those who had grown up in the movement, but hadn’t been engaged in it, until a person or program got them fired up about Reform Judaism (quite a few Jewish professionals in this group, too). The third aliyah was for people who came to Reform Judaism from the outside: people who were raised in another religious tradition, people who were raised in another movement, and people who grew up with no affiliation at all–Jewish or otherwise. Since Biennial is a conference for the movement’s leadership, one would think that the first two groups would be the largest. But far and away the largest group was the last one, the group composed of those who were at one time on the margins, and somehow, against all odds, found their way in. Watching this massive group of people chant the Torah blessings, I started to have a different kind of FOMO. This Fear of Missing Out was for all the connections I wasn’t making, all of the members–and potential members–of our community we weren’t reaching. For every person reaching out to place their hands on one of the Torah scrolls, there had to be at least ten who had never made it in the door. Just four months into my current rabbinic position, I began to wonder: Who is out there that we have yet to welcome into our tents? What sparks have we not yet kindled in those who sit in our pews, or in those who have yet to walk through our doors? And what barriers– physical, socioeconomic and spiritual–were keeping us apart from one another? After the blessings were chanted, we read the story of Abraham sending his servant to find a wife for Isaac, and I thought about how each of the story’s main characters shows audacious hospitality: Eliezar, who travels to a distant land to lead a young person toward her destiny; Rebecca, who rushes to meet the needs of a weary traveler; Abraham, who sends out an emissary to find the right person to continue his family’s traditions; and Isaac, who invites someone new into his tent, and loves her unconditionally. In the 21st century, we need to be all of the characters in this story: reaching out and inviting in, providing sustenance and showing love. If we don’t, think of all we might miss out on. If you have Biennial FOMO, check out some of the videos below, or others on the URJ YouTube Channel. Shabbat Evening Services at the URJ Biennial. Rabbi Rick Jacobs’ Keynote Address, including dancers! 1. Jews, being precursors to Christianity have the right to be respected. Judaism is accepted as an appropriate religious expression for Jews. 3. Anti-Semitism is a sin. After the film, Rabbi Golomb, Vassar Temple Senior Scholar, participated in a discussion on the film and took questions from the audience. Rabbi Polish recently attended an event marking the 50th anniversary of Nostra Aetate at the Vatican. As one (Bob Ritter) of several Vassar Temple members who attended the Federation’s event, I can tell you the experience was very enlightening and moving. It amazes me that Jews are still coping with deep seeded anti-Semitism that is partly rooted in positions there were only put down in 1965 by Nostra Aetate. Popularity of a film such as “The Passion of Christ” by Mel Gibson illustrate that such views are unfortunately still too prevalent today around the world. 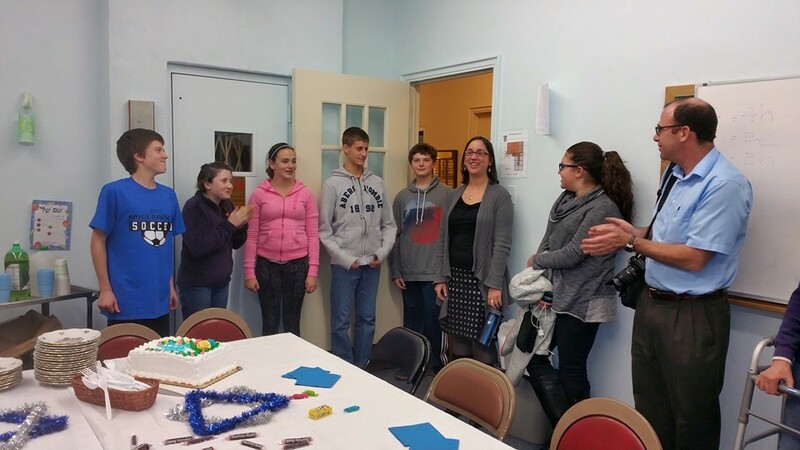 Many thanks to the Dutchess County Jewish Federation for making this event possible!